Draft: 2004, Houston Astros, 6th rd. A three-time All-Star and two-time World Champion, Ben is in his fourth season with the Cubs after he signed a four-year deal in December of 2015 ... the 2016 World Series MVP has played in all or parts of 13 seasons with Tampa Bay (2006-14), Oakland (2015), Kansas City (2015) and Chicago (2016-18), appearing at every position save for pitcher and catcher ... Since the start of his first full big league season in 2009, ranks fifth in the majors with 771 walks and is sixth with 326 doubles ... The switch-hitter reached double digits in home runs in 10-straight seasons from 2008-17 (had nine in 2018) ... has surpassed 30 doubles six times and has posted a .350 on-base percentage seven times ... Has logged significant playing time at second base (879 games), right field (453 games), shortstop (235 games) and left field (217 games) in addition to 34 games in center field, 27 games at first base and eight games at third base ... Has played in 64 career post-season games, hitting .241 (55-for-228) with four homers and 14 RBI ... Earned All-Star honors with Tampa Bay in 2009 (his first full big league campaign) and again in 2013 ... voted the N.L. All-Star squad's starting second baseman in 2016 ... Was the Rays recipient of the MLBPAA Heart and Hustle Award in 2011 and 2012 ... Played for the United States in the World Baseball Classic in 2013 ... Was the starting shortstop for Team USA at the 2005 World Cup in the Netherlands ... Is a native of Eureka, Ill., located approximately 140 miles southwest of Chicago ... originally attended Olivet Nazarene University in Bourbonnais, Ill., and was drafted by the Houston Astros in the sixth round of the 2004 Draft out of Dallas Baptist University. Ben batted a career-high .305 (139-for-455) in 139 games to record the sixth-best qualifying average in the National League ... drew 55 walks to contribute to a .378 on-base percentage, eighth in the N.L., and a 60-point improvement over his .318 OBP in 2017 ... His .305 average was the highest by a qualifying Cub in his age 37 season or older since Cap Anson hit .331 in his age 44 season 122 seasons ago in 1896 ... All told, batted .305 with 28 doubles, three triples, nine homers and 58 RBI in 139 games ... Is the first Cub to finish in the top-six in N.L. batting average since Starlin Castro in 2011 (sixth, .307) ... His .332 road batting average (77-for-232) was second-highest in the N.L., trailing only Arizona's Paul Goldschmidt (.339) ... Made starts at four positions, predominantly in right field (52 starts) and second base (42 starts) ... also made starts at left field (10) and at first base (three) ... Batted .375 (103-for-275) in team wins ... hit .200 (36-for-180) in team setbacks ... Hit .307 (31-for-101) with 47 RBI with runners in scoring position, the second-best average among qualifying Cubs (Heyward, .324) ... Landed on the 10-day D.L., April 21 (retro to April 18) with back tightness ... activated, April 28 ... Played in his 1,500th career game, May 25 vs. the Giants ... went 2-for-4 with a double, two runs and two RBI ... Notched six extra-base hits and seven RBI in a five-game span from May 29-June 2 ... went 10-for-21 with four doubles, two homers, four walks and five runs scored ... Was ejected by home plate umpire Phil Cuzzi, August 14, arguing balls and strikes after going 1-for-3 with a double ... was his first career ejection ... Doubled in a season-high four-straight games from July 27-August 1, tied for the longest streak by a Cub this season and his longest streak since 2011 (July 22-25) ... Delivered a walk-off single, August 28 vs. the Mets ... his sixth-career walk-off RBI and first with the Cubs ... Had five hits and two RBI in a two-game span at the White Sox, September 22-23 ... Went 1-for-6 in the N.L. Wild Card Game, October 2 vs. the Rockies. Ben played 128 games in his second season with the Cubs, hitting .232 (101-for-435) with 20 doubles, 12 home runs and 50 RBI ... hit .249 (56-for-225) in the season's "second half," 35 points higher than his .214 (45-for-210) average prior to the All-Star break ... the team was 59-46 in his starts... Played 81 games (65 starts) at second base, 36 (13 starts) in left field, 32 (27 starts) in right field, five at first base and five at shortstop ... combined for a .991 fielding percentage (3 E/340 TC)... Batted .249 (82-for-329) with 11 homers as a left-handed batter, and hit .179 (19-for-106) with one home run as a right-handed batter... Made 40 starts as the leadoff hitter with the club going 25-15 in those games ... overall, he batted .253 (41-for162) in the first spot in the lineup ... hit his fourth-career leadoff home run, May 21 vs. Milwaukee... Recorded nine go-ahead RBI and four game-winning RBI ... had 14 two-out RBI... Reached base safely in 25-straight games from April 28-May 30 ... hit .291 (25-for-86) with a .385 OBP in that stretch ... was the second-longest on-base streak of his career (31 with Tampa Bay in 2009-10)... Went 13-for-28 (.464) with a double, triple and three homers in an eight-game stretch, May 13-25... Was placed on the 10-day disabled list June 16 (retroactive to June 13) with left wrist inflammation ... appeared in two rehab games with Double-A Tennessee, going 3-for-6 with two walks ... was activated July 1... Enjoyed his strongest month at the plate in August, when he batted .280 (23-for-82) with 15 runs, two homers, eight RBI and a .366 OBP in 27 games... Had a season-high 10-game hitting streak, April 28-May 7 (.282/11-for-39)... Belted his fourth career pinch-homer off Philadelphia's Yacksel Rios, August 26... Tied his career high with four runs scored, September 13 vs. the Mets... Homered twice in a three-game stretch, September 24 at Milwaukee and September 26 in St. Louis... Went 4-for-26 (.154) with two doubles, three runs scored and a walk in nine postseason games. Ben was voted as the National League's starting second baseman in the All-Star Game and went on to earn World Series MVP honors with the game-winning hit in Game Seven ... in his first season with Chicago, he batted .272 (142-for-523) with 31 doubles, three triples, 18 home runs, 76 RBI and 96 walks ... His 96 walks ranked fifth in the N.L. and were his most since drawing a career-high 97 in 2012 with Tampa Bay ... were the most by any Cub since Carlos Pena had 101 in 2011. w His 96 walks were the most by a switch-hitter in franchise history ... Led N.L. switch-hitters with 94 runs scored, was second with 31 doubles and a .386 OBP, fourth with 142 hits and a .446 slugging percentage, and seventh with 18 homers ... Appeared at five positions, predominantly at second base (119 games, 113 starts) ... also saw time in left field (27 games, 11 starts), right field (24 games, 18 starts), first base (1 game) and shortstop (1 game) ... Posted a .301 average (43-for-143) with a .401 OBP against left-handed pitching ... had a .261 average (99- for-380) with a .380 OBP and 14 of his 18 homers vs. righthanders ... Batted .297 (83-for-279) with a .912 OPS on the road ... hit .242 (59-for-244) with a .739 OPS at home ... Had 32 RBI with two outs in an inning, second-most on the team (Russell, 34) ... Had two multi-homer efforts: May 6 vs. Washington and September 30 at Cincinnati ... Belted two lead-off homers: June 15 at Washington and June 28 at Cincinnati ... Had a .406 batting average (41-for-101), with six homers and 25 RBI in May. w Elias reports that he is the first player to produce at least 40 hits and 25 or more RBI for the Cubs in a calendar month since Alfonso Soriano did so in May of 2008 (.345, 40-for-116, 10 HR, 29 RBI) ... Had 11 RBI in three games, May 4-6, the first Cub to accomplish the feat since Sammy Sosa (16 RBI), August 10-12, 2002 … became the first Cub with three or more RBI in three-straight games since Sosa in April of 2003 ... Named N.L. Co-Player of the Week for May 2-8 (with the Mets Bartolo Colon) after leading the majors in that span with 15 RBI … was tied for the N.L. lead with four homers and eight runs scored as he batted .360 with a .455 on-base percentage and RBI in six-straight games ... Reached safely in nine-straight plate appearances and hit safely in seven-straight at-bats from May 8-11 … was just two shy of the team record ninestraight at-bats with hit, set by Sammy Sosa in 1993. w First Cub to reach safely in nine-straight plate appearances since Aramis Ramirez in August of 2011 ... Reached safely in 35-straight starts from April 18-May 30, culminating with a career-high tying 16-game hitting streak, May 13-30 ... hit .426 (26-for-61) with a 1.116 OPS during the 16-game hitting streak. w Was the first Cub to reach safely in 35-straight starts within a single season since Starlin Castro, who reached in his final 40 starts of 2011 ... Hit .330 (37-for-112) with 20 runs, 10 doubles, two triples, a homer and 19 RBI in 31 games from July 23-August 27 after he batted just .172 (26-for- 151) in 41 games from May 31-July 22 ... Had three homers in his final three games, including his seventh career multi-homer effort, September 30 in Cincinnati ... Batted .250 (16-for-64) with five doubles, a triple and five RBI in 17 postseason games ... Became the first-ever Cubs player to with the World Series Most Valuable Player award (originated in 1955) by going 10-for-28 (.357) with two doubles, a triple, two RBI and five runs scored in the Series ... put the Cubs on top with an RBI double in the top of the 10th inning of the decisive Game Seven. Was named the Rays' MVP by the Tampa Bay Chapter of the Base- ball Writers' Association of America after batting .272 with 10 home runs and 52 RBI in 146 games…added 75 walks for a .354 on-base percentage…tied for seventh in the American League in walks…had his franchise-best string of five consecutive seasons of at least 150 games played come to an end as he made his first trip to the disabled list since2008 with a dislocated left thumb…his 919 games played since 2009 areninth most in the majors…led the Rays in walks for the fifth time in the last six years…also led the team with 83 runs (tied), 34 doubles, .354 on-base percentage, .749 OPS and 18 infield hits (tying his career high)…his 504 walks since 2009 are fifth most in the majors over that span…has 483 unintentional walks, which is tops in the majors since then…hadhis sixth straight season of 70-plus walks, which is the now the longestcurrent streak in the majors following the retirement of Adam Dunn…had his seventh straight seasonof 10-plus home runs, the longest current streak among Major League switch-hitters…reached double-digit homers and steals for the sixth straight year, joining Hanley Ramirez (9 seasons) and AndrewMcCutchen (6) as the only players with current streaks that long…over the last six years (since 2009), he leads all switch-hitters in doubles (211), extra-base hits (338) and walks (504) and is tied with Erick Aybar for the lead in hits (910)…is tied for third in RBI (454)…the walks rank second among allAL hitters and fifth in the majors…struck out 84 times and his average of 7.79 plate appearances perstrikeout was the highest mark of his career…started at five defensive positions (74 at second base, 23 atshortstop, 17 in left field, 16 in right field, seven in center field)…in only one other season has he startedat more defensive positions: seven in 2009…was one of six players in 2014 to start at all three out field positions and at both middle infield positions (Brock Holt, BOS; Elian Herrera, MIL; Enrique Hernandez, HOU/MIA; Emilio Bonifacio, CHI/ATL; Mike Aviles, CLE)…is one of only four active players to play at least 30 career games at those five positions, joining Brent Lillibridge, Willie Bloomquist and Bonifacio…is the first ML player since records are available to play in 200 career games at second base,shortstop and right field…charged with six errors in 79 games at second base after making only fourthere in 125 games in 2013…for the sixth time in seven seasons he was error-free in the outfield…his.997 career elding percentage as an outfielder is the best among active players (min. 400 games)…nowhas a 98-game errorless streak in the outfield dating back to Aug. 14, 2012…finished second to LorenzoCain (KC) in the Fielding Bible Awards for the Multi-Position category…hit .340 (53-for-156) againstleft-handed pitching compared to .246 (102-for-414) against right-handers…the mark against lefties ranked eighth in the AL…batted .225 with runners in scoring position, but hit .375 starting July 4, when he ended a 1-for-43 stretch with RISP…had a career .273 average with RISP entering 2014…hit .193with RISP and two outs…was 1-for-12 (.083) with the bases loaded…hit .316 during the day…hit five of his 10 home runs in interleague play…batted leadoff in 47 starts…started in the No. 2 hole 74 times… batted .300 in the No. 2 spot, and the Rays were 42-32 in those games. Played in 157 games, matching his career high (2012), and became the first Ray to play in 150-plus games five years in a row (2009-13)…only five other major leaguers have done it in the same time frame: Hunter Pence, Adrian Gonzalez, Prince Fielder, Robinson Cano and Billy Butler…led the Rays in innings played at 1376.2, tied for most in club history with Delmon Young's 2007 total... Nominated for the AL Rawlings Gold Glove Award at second base despite starting at four different positions (117-2B, 21-SS, 39-RF, 4-LF)…won the AL fielding crown at second base with a franchise-record .993 fielding pct., edging out BOS Dustin Pedroia (.9928 to .9927)…the previous club record at second base was .990 set by Akinori Iwamura in 2008…also set a club record with 81 straight errorless games at second base from May 11-Aug 30…was the only AL player with at least 10 starts at both middle infield positions and in the outfield in 2013…SD Alexi Amarista, SD Logan Forsythe and PHI Freddy Galvis did so in the NL... Led the Rays with a career-high 168 hits…also led the club in OBP (.354), game-tying and goahead RBI (28), multi-hit games (49) and walks (72)... His 121 doubles over the last three seasons (2011-13) rank 4th in the majors behind Robinson Cano (135), Adrian Gonzalez (124) and Alex Gordon (123)... Over the last three years he leads all switchhitters in doubles (121), extra-base hits (189) and is one shy of Jose Reyes in hits (477)... His 429 walks in the last five years (2009-13) lead the AL and rank 4th in the majors…with 467 career walks, passed Carlos Peña (460) for the Rays record on Sep 13 at MIN with a free pass off Kevin Correia…in the last 50 years, only three other middle infielders (min. half of games played at 2B and/or SS) have drawn this many walks over a five-year span: Alex Rodriguez (2000-04), Joe Morgan (many times) and Bobby Grich (1972-76)... According to Baseball Reference, ranks 3rd in the majors since the start of 2009 with a combined 32.9 wins above replacement (WAR), after Robinson Cano (34.2) and Miguel Cabrera (33.7)…WAR counts offensive and defensive contributions relative to a player's position(s)... Over the last five seasons, no player can match his combination of doubles (177) and triples (25)... In addition to being the club's all-time walks leader, ranks 2nd in Rays history in triples (29), 3rd in games played (918), at-bats (3,280), runs scored (482) and stolen bases (92) and 4th in hits (861), doubles (195) and RBI (459)…is also 1st in sac flies (40) and his 5 grand slams are tied for 1st with Carlos Peña... He and Yunel Escobar combined to make only 11 errors, matching the 2nd fewest ever by an AL double play combination (both players qualifying for fielding crown)…Robinson Cano and Derek Jeter committed only 9 for the 2010 Yankees…Cal and Billy Ripken had 11 for the 1990 Orioles and Mark Loretta and Alex Gonzalez had 11 for the 2006 Red Sox... Only appeared in 42 games in the outfield, but did not commit an error in 53 chances…leads all active players (min. 300 games) with a career .997 fielding pct. (2 errors in 597 chances)... Struck out in only 13 pct. of his plate appearances, lowest rate of his career…swung at 40.1 pct. of his pitches seen, 9th-lowest rate in the AL…chased 23.9 pct. of pitches out of the zone, 8th-lowest rate in the AL... Recorded the third multi-HR game of his career on Aug 13 vs. SEA…the first leadoff HR of his career was also the 100th HR of his career…both Zobrist and SEA Brad Miller led off Aug 13 with a home run, the first time that had happened in an AL game since Aug 17, 2006…both homered twice in the game... Tied a franchise record June 10 vs. BOS with 5 hits (6th time, last by Jeff Keppinger on June 23, 2012 at PHI)... Named by the Tampa Bay chapter of the BBWAA as winner of the Paul C. Smith Champion Award, given to the player who best exemplifies the spirit of true professionalism on and off the field. WORLD BASEBALL CLASSIC: Played 4 games for Team USA, going 3-for-11 with 3 BB and 1 RBI…made starts at RF, DH and 3B. ALL-STAR GAME: Selected to the 2013 All-Star Team by Tigers Manager Jim Leyland but did not play…it was his second All-Star selection (also 2009). POSTSEASON: Started all 5 of the Rays postseason games at 2B…hit a solo homer in Game 1 of the ALDS at Boston off Jon Lester, the second postseason homer of his career…compiled a 9-game postseason hitting streak that ended after Game 1, tying B.J. Upton for the longest in Rays postseason history. Played in a career-high 157 games (156 starts,59-RF, 47-SS, 46-2B, 4-DH)...according to Stats Inc., became the first player since records are available (1921) to start at least 45 games at three different positions in the field...the closest any other player came was Hall of FamerStan Musial in 1948 (63-CF, 51-RF, 41-LF)...Is only the second Ray to play in 150-plus games in four consecutive seasons, joining Carl Crawford (2003-06)...Led the Rays in games started, hits (151), runs scored (88), doubles (39), triples (7, tied), extrabase hits (66), walks (97), OBP (.377) and multihit games (42)...ranked second on the club to B.J. Upton in home runs (20) and RBI (74)...finished tied for sixth in the AL in triples and tied for eighth in the AL in doubles and 9th in OBP...Led all major league switch-hitters in doubles and extra-base hits for a second straight season, the first player to do this since CIN PeteRose (1975-76)...also leads all switch-hitters with 141 doubles since the start of 2009...during that same span, no other player in baseball can match his combination of doubles and triples (22)...Had a .200 batting avg. as late as June 7...after that date, hit .307/.402/.523 (112-for-365) over his final 102 games...Moved to shortstop on Aug 9 vs. TOR and started there 47 of the remaining 52 games (including each of the final 27 games)...prior to that, had not appeared at shortstop since June 23, 2009 or started there since May 30, 2009...Committed only 4 errors in 47 games (189 total chances) at shortstop...his .979 fielding pct. at shortstop would have ranked seventh in the majors if he had enough games to qualify and exceeded the major league average of .973 for shortstops...entered the season with a career .953 fielding pct. at shortstop in 130 games...His 97 walks were 2nd most in the majorsto CWS Adam Dunn (105) as well as a career high...tied for the 2nd-highest total in club history, trailing Carlos Peña (103 in 2007) and tying B.J. Upton (2008)...swung at 37.0 percent ofpitches seen, tied with BOS/CWS Kevin Youkilisfor 2nd-lowest rate in the AL behind MIN JoeMauer (34.8)...Over the last four seasons (2009-12), his 357 walks lead the AL and rank 5th in the majors...the last middle infielder to draw this many walks over a four-season span was Joe Morgan, who totaled 382 BB from 1977-80 (min. half of total games played at 2B and/or SS)...According to Baseball Reference, leads themajors since the start of 2009 with a combined26.6 wins above replacement (WAR), just ahead of Albert Pujols (26.4)...WAR counts offensive and defensive contributions relative to a player's position(s)...Following the season was rated by MLB Network as the No. 6 right fielder in the gameand the No. 2 right fielder by Bill James...Owns a career .415 avg. (22-for-53) with the bases loaded, 2nd highest among active players (min. 50 AB) behind DET Miguel Cabrera (.416). Hit .297/.395/.520 (88-for-296) on the road with12 HR, 46 RBI and 24 2B...ranked fourth in the majors with a .916 OPS on the road...by contrast, hit .239/.356/.417 (63-for-264) at home with eight HR, 28 RBI and 15 2B...over the last three seasons has 30 HR and 160 RBI on the road, compared to 20 HR and 80 RBI at home...Led the Rays with 28 game-tying and go-ahead RBI...Ranks third on the Rays all-time list in triples (26), runs scored (405) and walks (395)...his five grand slams are tied with Carlos Peña for the club record...ranks 4th on the Rays career list in games played (761), hits (693) and stolen bases (81)...his 34 sacrifice flies are one shy of Carl Crawford's club record...Recorded multiple hits in five consecutive games from June 8-15, matching his career high and the longest by a Ray since Evan Longoria went six games (Aug 31-Sep 5, 2009)...this raised his season avg. from .200 to .235...On June 9 at MIA, became the fourth Ray to reach base safely five times and hit two home runs in the same game, joining Jose Canseco (June 14, 1999 vs. CWS), Carlos Peña (Aug 31, 2007 vs.NYY) and Desmond Jennings (Aug 28, 2011 vs. TOR)...Had two walk-off hits, both coming in extra innings...on July 20 vs. SEA, broke a 3-3 tie in the 14th inning with an RBI triple scoring Carlos Peña...on Sept. 7 vs. TEX, hit a two-run homer off Mark Lowe in the 11th inning for a 3-1 win, his first career walk-off home run...His .996 career fielding pct. in the outfield ranks second among active players (min. 300 games), just percentage points behind BOS Jacoby Ellsbury (.996)...has two errors in 544 chances...went 270 errorless games before committing his first error in the outfield, a throwing error on May 22 vs. TOR...according to the Elias Sports Bureau, this was the most errorless games in the outfield to start a major league career since OAK/SF Darren Lewis played 392 errorless games from 1990-94...Zobrist went 479 total chances in the outfield before his first error...With B.J. Upton on the DL, started the first 13 games of the year in right field...drew an AL-high 19 walks in April, 2nd most in club history after Jonny Gomes (22 in April 2006)...his .443 OBP in June ranked 4th in the AL and second in club history for June behind Fred McGriff (.500 in June 2001). Led the team with a career-high 156 games played including 153 starts (117-2B, 22-RF, 3-DH)...also led the Rays in runs (99), hits (158), doubles (46) and extra-base hits (72)-all career highs...Led all major league switch-hitters in extra- base hits and doubles...overall was 6th in the AL in extra-base hits and tied for 3rd in doubles...had 43 extra-base hits by the All-Star break, more than he had for the entire season in 2010 (40)...only 9 switch-hitters in AL history have had as many extra-base hits in a season: Mickey Mantle, Ruben Sierra, Mark Teixeira, Bernie Williams, Brian Roberts, Jose Cruz, Kendrys Morales, Ray Durham and Carlos Beltran...Only one switch-hitter in AL history has had more doubles in a season: BAL Brian Roberts...is one of only four switch-hitters with 100 doubles over the past three seasons (2009-11): Victor Martinez (105), Mark Teixeira (105), Pablo Sandoval (104) and Zobrist (102).His 260 walks over the past three seasons are 10th most in the majors, 3rd in the AL...Batted .311 on the road-8th in the AL, and 90 points better than his average at home (.221, 6th-lowest in AL)...this was the greatest disparity in the majors in 2011...the last player with a greater margin in road average over home was SD Chase Headley in 2009 (.305 to .208)...His 60 RBI on the road were 4th in the majors behind PHI Ryan Howard (63), LAD Matt Kemp (63) and BOS Adrian Gonzalez (62)...Had 32 more extra-base hits than his 2010 total in only 19 more plate appearances...Is one of four players with 50 steals and 250 RBI over the last three seasons (2009-11), joining NYY Curtis Granderson, MIL Ryan Braun and LAD Matt Kemp...The Rays were 88-68 with Zobrist in the lineup...in the 88 wins, he batted .333 (113-for- 342) with 16 HR and 77 RBI...in the 68 losses, he batted .179 (44-for-246) with 4 HR and 14 RBI...Did not commit an error in 38 games in the outfield and now has 237 career games (423 total chances) without an error in the outfield...Hit 7 HR in his first 25 games and 5 HR in his last 11 games...only hit 8 in 120 games between...5 of his last 10 hits were home runs...Hit his 5th career grand slam on July 15 vs. BOS, surpassing Carlos Peña for the club record...hit an inside-the-park home run on Sep 25 vs. TOR off Brett Cecil...was the first of his career and 10th in Rays history...Selected as one of the five AL players for the MLB All-Star Game Final Vote...was the 4th Ray to make the Final Vote fan ballot, joining Carl Crawford (2005), Evan Longoria (2008) and Carlos Peña (2009)...Longoria is the lone Ray to win...Was named AL Player of the Week (April 24-May 1) after batting .440 (11-for-25) with 2 HR, 5 doubles and 13 RBI in 6 games...during that week combined for 10 RBI in a doubleheader on April 28 at MIN...the last player with 10-plus RBI in 2 games in a doubleheader was STL Mark Whiten (13) on Sep 7, 1993 at CIN (1 in Game 1, 12 in Game 2)...the last player with 10 RBI in a day (single game) was LAA Garret Anderson on Aug 21, 2007 vs. NYY (10)...in Game 1, collected a career-high 4 hits and a club-record 8 RBI...his 8 RBI tied TEX Nelson Cruz for most in one game in 2011...Had 18 RBI in 5 games from April 21-25...the last AL player to do that was Reggie Jackson (18) from June 14-18, 1969...the last ML player to do it was CHC Sammy Sosa (18) from Aug 10-14, 2002...Went 4-for-6 with 4 extra-base hits (3-2B, 1-3B) on June 11 at BAL...became the second in club history with 4 extra-base hits and 4 runs in one game, joining Tomas Perez on July 29, 2006 at NYY...Matched his career high with a streak of 9 straight games with at least one walk from May 10-18...only 2 players in the majors had a longer streak in 2011: TOR Jose Bautista and ARI Ryan Roberts each had 10...Missed the game on Sep 20 at NYY due to the birth of his daughter, Kruse, the second child for he and his wife, Julianna...POSTSEASON: Started at second base all 4 games of the ALDS vs. Texas and was one of two Rays to hit safely in all 4 games (also Desmond Jennings)...has a current 7-game postseason hitting streak, 2 shy of the Rays club record of 9 held by B.J. Upton. Super utilityman signed a three-year contractextension on April 23 with club optionsfor 2014 and 2015 ... if both options are exercised,he would earn just under $30 millionover the life of the contract ... he will donateup to $450,000 during the life of the contractto the Rays Baseball Foundation, the team'scharitable foundation that supports youth andeducation programs in the Tampa Bay region. ... Started 144 games at five different positions(79-RF, 46-2B, 9-CF, 9-1B, 1-3B) ... started atseven defensive positions in 2009 ... batted everywherein the lineup except ninth. ... Collected a career-high 92 walks (4th in AL),passing his 2009 total of 91 ... his 183 walksover the last two seasons (2009-10) led the AL. ... His .374 on-base pct. over the last two seasonstied NYY Mark Teixeira for 6th in the AL. ... Stole a career-high 24 bases and was caughtonly 3 times ... his 88.9 percent success rateranked 3rd in the AL (min. 20 attempts) behindOAK Coco Crisp (91.4) and SEA Franklin Gutierrez(89.3) ... 24 steals ranked 3rd on the team. ... Was one of four Rays to reach double digitsin home runs (10) and stolen bases (24), alongwith Crawford, Upton and Evan Longoria,most of any team in the majors. ... Did not commit an error in 110 games in theoutfield ... his 1.000 fielding pct. tied TOR VernonWells and SEA Franklin Gutierrez for theML lead among outfielders ... he has nevercommitted an error in 199 career games in theoutfield (357 total chances). ... Tied NYM David Wright for the major leaguelead with 12 sacrifice flies ... set a club record,passing John Flaherty (10 in 1999). ... Recorded 7 bunt singles, tied with Sean Rodriguezand six others for the AL lead. ... Tied a career high with 28 doubles (also 2009). ... Switch-hitter batted .260 (46-for-177) with3 HR from the right side and .232 (83-for-358)with 7 HR from the left. ... Did not hit a home run until May 20 at NYY offAndy Pettitte ... went 38 games and 146 atbatsbefore his first homer. ... Compiled a 16-game hitting streak across2009 and 2010, with 8 games on each side ... this matched the 4th-longest streak in clubhistory, 3 games shy of Jason Bartlett's clubrecord19-game streak in 2009 ... though thestreak was snapped April 14 at BAL, an onbasestreak continued that went on to reach31 games (Sep 13, 2009.April 16, 2010). ... His batting average fell nearly 60 points from2009 (.297 to .238), despite reaching .315on June 9 ... hit .177 (50-for-283) in 84 gamesfrom June 22 through season's end, but drew64 walks in that span ... after returning Aug 4from missing 6 games with lower back stiffness,hit .146 (14-for-96) over his next 31games (through Sep 6) ... in September wentthrough separate 0-for-23 and 0-for-18 skids. ... Hit safely in a club-record 23 straight roadgames, May 10.July 1 ... for the season, hit.258 (77-for-299) with 7 HR on the road, comparedto .215 (52-for-242) with 3 HR at home. ... Saw an average of 4.10 pitches per plate appearance,tops on the club and 10th in the AL. Selected the team MVP by the Tampa Baychapter of the BBWAA...finished eighth in theAL MVP vote, the highest finish of any Ray inclub history...Super utilityman became the first player tostart at 7 different defensive positions in oneseason since MIN Denny Hocking did thesame in 2001...first Rays player to do it...started110 of the final 113 games, and started 135games total (81-2B, 37-RF, 6-SS, 5-CF, 2-1B,2-LF, 1-3B, 1-DH)...batted everywhere in thelineup except 9th...had made 125 starts in histhree-year career prior to 2009...Hit 27 home runs, 20 more than any player hashit in the last 50 years while starting at 7 differentdefensive positions...next closest is STLJose Oquendo with 7 in 1988...Finished 4th in home runs (27) and RBI (91)among major league switch-hitters...bothclub records for switch-hitters...Tied for 3rd in the AL in OPS (on-base pct. plusslugging pct.) with NYY Mark Teixeira with a.948 mark...3rd-highest figure in Rays history...Led Rays in BB (91), SLG (.543) and OBP (.405),finishing 6th, 7th and 9th in the AL respectively...tied McGriff (1999) for 2nd-highest OBP inclub history behind Peña's .407 in 2007...Tied with MIN Jason Kubel .. for the AL lead with3 pinch-hit home runs, matching Bubba Trammell(2000) for the club mark...hit a pinchhitslam off Matt Thornton in the 6th inningApril 17 vs. CWS taking the Rays from a 5-2deficit to a 6-5 win...hit a game-tying, 2-runpinch-homer in the 9th inning off All-Star AndrewBailey on May 21 vs. OAK in Rays 6-5win...also added a pinch-homer off All-StarJoe Nathan in a 4-3 loss on April 28 at MIN...Hit safely in 19 of his last 21 games (.403, 31-77, 8-2B, 1-3B, 4-HR, 19-RBI) raising his averagefrom .278 to .297...Tied with 3 others for AL lead with two grandslams giving him 4 for his career, most in Rayshistory, in only 24 bases-loaded AB...he was7-for-13 with 3 HR and 3 walks with the sacksloaded...was 4-for-6 with the bases loadedand 2 outs...Also added a team-high 6 three-run homers,tied for 3rd in the AL...Started 65 games at 2B in an 80-game spanbetween May 25-Aug 28 when Akinori Iwamurawas sidelined with a knee injury...Did not commit an error in 70 games (44 starts)in the OF...has not made an error in the outfieldduring his career in 89 games, 56 starts...in just 59 games (37 starts) in 2009 started 4double plays from RF, tied with LAA BobbyAbreu for the most among AL right fielders...Had a big hand in three of the Rays biggestcomebacks of the season...hit a game-tyingsolo home run in the 8th inning May 15 vs.CLE in a game the Rays won 8-7 after trailing7-0...on July 25 at TOR had 3 hits and 3 runsscored, and in the 12th inning he singled andscored the winning run in the Rays 10-9 win asthey came back from a 8-0 deficit...had tworunsingles in the 8th and 9th innings Sep 27at TEX as the Rays won 7-6 after trailing 5-0in the 8th...Hit for a .538 (35-for-65) average on the firstpitch, 4th best in the majors and 2nd best inclub history behind Russ Johnson's .545 markin 2001...Saw an average of 4.05 pitches per plate appearance,tops on the club...Batted a team-high .330 (71-for-215) vs. theAmerican League East...Hit 8 home runs in June, tied for the AL lead...in club history, only Jose Canseco (9 HR inJune 1999) hit more in the month of June...All-Star Game: Named to his first All-StarTeam becoming the first player to be selectedafter starting at six different positions...playedthe last two innings at 2B, catching the final outof the game on a pop fly to shallow right field...was selected by Manager Joe Maddon. Super utilityman had 4 stops with the Rays,and was recalled for good on Aug 5...playedin 62 games with 49 starts...played 6 differentpositions (2B, 3B, SS, LF, CF, RF), startingat five (33-SS, 8-LF, 4-2B, 3-CF, 1-RF)...wason course to make the big league club out ofSpring Training before suffering a left thumbfracture.Hit four home runs in the final 4 games of theseason at Detroit and earned co-AL Player ofthe Week honors.Led all ML middle infielders with a 16.5 ABper-HR ratio (min. 10 HR)...finished ahead ofFLA Dan Uggla (16.6), FLA Hanley Ramirez(17.9) and PHI Chase Utley (18.4)...prior to2008 had only 3 HR in 280 major league atbats(93.3-AB/HR) and 19 HR in 1,251 AB inthe minors (65.8).Belted his 2nd grand slam of the season andhis career Sep 13 at NYY in the nightcap of adoubleheader...was the last visiting player tohit a grand slam at Yankee Stadium, connectingoff Sidney Ponson in the 4th inning.First career grandslam came Aug 29 vs. BALoff Fernando Cabrera, and Gabe Gross followedfor back-to-back homers...the onlyother time a Rays grand slam had been partof back-to-back HR was May 3, 1998 at CLE(Charles Nagy) when Bobby Smith backed upPaul Sorrento's slam.Tied his career high with 4 RBI on Sep 25 atDET, his first career multi-homer game...hita solo shot in the 1st and added a 3-run shotin the 8th, both off Armando Galarraga...hadthree 4-RBI games in 2008.On July 18 vs. TOR, belted a 2-run go-aheadhomer from the 9th spot in the order off A.J.Burnett in the 7th inning, providing the decisiveruns in the Rays 2-1 victory.Recalled June 24-27 as Jason Bartlett's sonwas born...homered June 25 and 26 at FLA...was optioned back to Durham on June 27...first game back after recall on July 5, homeredoff KC Horacio Ramirez, giving him 3 straightgames with a long ball and 3 HR in a stretchof 8 AB.Went 2-for-3 with a homer on July 23 vs. OAK...was optioned to Durham following the game.On Sep 6 at TOR he played three different positions(SS, LF, 3B) in consecutive innings.Spent the first 38 games on the big league DLwith left thumb fracture...was activated onMay 13 and optioned to Durham May 30. Twenty-five year-old played in 31 games over a pair of tours with the Rays until a right oblique strain sidelined him the final six weeks of the season ... Rays Opening Day shortstop started 13 of the first 17 games, then just 2 of the next 17 until he was optioned to AAA Durham on May 11 when Josh Wilson was claimed off waivers from the Nationals ... Hit safely in 4 consecutive games April 9-12 (7-19, .368) ... then collected just 2 hits in his last 27 AB (10-K) before his option ... Had his best game Apr 11 at Texas, going 2-for-5 with his 3rd career home run (off Robinson Tejeda) ... est. 421 ft. ... Scored the winning run in two walk-off victories: May 2 vs. Minnesota on Navarro's infield grounder and May 5 vs. Oakland on Brendan Harris' 12th-inning single ... Recalled July 29th from AAA Durham after Ty Wigginton was dealt to the Astros. Appeared in a dozen games (11 starts) when he exited Aug. 18 vs. Cleveland during his first AB with the oblique injury ... Was 5-for-32 (.156) his 2nd tour ... was hitless in his last 15 AB ... Had only two hits in 24 AB's with RISP (.083) ... Appeared in 60 games with the Bulls (at SS and DH) batting .273 with 14 doubles, 2 triples, 7 home runs and 22 RBI ... drew 43 walks with only 38 strikeouts ... had a .399 on-base percentage and an .849 OPS ... committed 11 errors ... Hit at a .300 clip in July (21-for-70) with a base hit in 14 of his last 18 games ... The switch-hitting shortstop was acquired by the Rays July 12, 2006 from Houston along with RHP Mitch Talbot in exchange for 3B Aubrey Huff and cash ... Only the Tigers' Joel Zumaya is lower on major league baseball's alphabet lexicon than Zobrist among active players. The 25-year-old switch-hitting infielder made the jump to the big leagues after only 18 games at the Triple-A level...he was acquired from the Houston Astros on July 12 along with right-handed pitcher Mitch Talbot in exchange for third baseman Aubrey Huff and cash...Was rated by USA Today as the 5th-best prospect traded at the deadline...Was one of four switch-hitters on the club (Greg Norton, Tomas Perez, Dioner Navarro)...He began the season with AA Corpus Christi of the Texas League, batting .328 in 82 games with a team-high 25 doubles, leading the league with six triples and 55 walks...named a Texas League All-Star...He then hit .304 in 18 games at shortstop with AAA Durham after the deal...He was recalled Aug. 1 from Durham along with BJ Upton taking over regular SS duties when Julio Lugo was traded to the Dodgers July 31...started 50 of the final 56 games, all at shortstop...appeared in 52...Made his major league debut that night at home vs. the Tigers and went 0-for-4 against Justin Verlander & Co...grounded out to 2nd base his first at-bat...Began his career with the Rays 1-for-17, but then batted .241 (40-166) in 44 games from that point...Reached base safely via hit or walk in 38 of his 50 starts...Hit in a season-best 9 straight games Aug 22-31 (.286, 10-for-35)...Had his best game as a big leaguer in an August 6 win over Boston with his first ML home run (Jason Johnson), a double and a season-high 3 RBI...was his 6th game...Both of his home runs came batting lefthanded...belted his 2nd home run Sept 2 off Seattle closer J.J. Putz, who surrendered just 4 home runs all year...had 2 total HR in 100 games in the minors before his callup and just 11 for his career before joining TB...Singled off Curt Schilling Aug 4 in the 5th inning for his 1st major league hit...first RBI was Aug. 2 vs. DET, a squeeze bunt that tied the game 2-2 in the 5th... Average reached a high of .242 on Sep 12 after going 2-for-4 with a pair of RBI in his first game at Yankee Stadium...His 242 total chances ranked 5th most among major league shortstops from Aug. 1...committed 9 errors, tied with DET Carlos Guillen, WSH Felipe Lopez and TOR John McDonald for 3rd most among ML shortstops behind FLA Hanley Ramirez (12) and MIN Jason Bartlett (10)...had just a pair of miscues thorugh his first 20 games until a 2-error game Aug. 23 vs. Texas...On Sep 2 vs. SEA he combined with C Dioner Navarro on the first "2-6-2" triple play in Major League history...Was the 2nd triple play in club history...Hit just .204 (21-103) at Tropicana Field compared to .250 on the road (20-80) but had 8 of his 10 extra-base hits at the Trop; (including both HRs) as well as 14 of his 18 RBI...Mainly hit 9th in the order but also hit leadoff, 2nd and 8th...Following the season played in the Arizona Fall League where he was named to the All-Prospect Team...batted .366 (37-101) for the champion Phoenix Desert Dogs, 3rd in the AFL...led the league with 29 runs scored and reached base in all 28 games played, including the championship game...also ranked 3rd in the league with a .469 on-base percentage...slugged .515 and knocked in 21 RBIs...was one of eight players to receive a league MVP vote. Selected to play for Team USA in the World Cup held in the Netherlands...named Carolina LeaguePlayer of the Week for the week of 8/8-14...South Atlantic League All-Star...led Salem with a .333 batting average. Named Topps Player of the Month (August), NY-Penn League Post-Season All-Star, and NY-Penn League Rookie of the Year...named Tri-City MVP...selected as Tri-City's offensive player of the month for June & August...led the NYPL in batting (.339) and on-base percentage (.438), second in hits (87). April 28, 2018 Chicago Cubs activated 2B Ben Zobrist from the 10-day injured list. 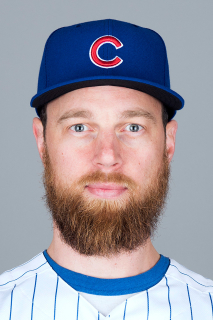 April 21, 2018 Chicago Cubs placed 2B Ben Zobrist on the 10-day disabled list retroactive to April 18, 2018. Back tightness. July 1, 2017 Chicago Cubs activated 2B Ben Zobrist from the 10-day disabled list. June 29, 2017 Chicago Cubs sent 2B Ben Zobrist on a rehab assignment to Tennessee Smokies. June 16, 2017 Chicago Cubs placed 2B Ben Zobrist on the 10-day disabled list retroactive to June 13, 2017. Left wrist inflammation. December 8, 2015 Chicago Cubs signed free agent 2B Ben Zobrist. November 2, 2015 2B Ben Zobrist elected free agency. July 28, 2015 Oakland Athletics traded Ben Zobrist and cash to Kansas City Royals for RHP Aaron Brooks and LHP Sean Manaea. July 28, 2015 Kansas City Royals activated 2B Ben Zobrist. May 25, 2015 Oakland Athletics activated 2B Ben Zobrist from the 15-day disabled list. May 21, 2015 Oakland Athletics sent 2B Ben Zobrist on a rehab assignment to Nashville Sounds. May 19, 2015 Oakland Athletics sent 2B Ben Zobrist on a rehab assignment to Stockton Ports. January 10, 2015 Tampa Bay Rays traded 2B Ben Zobrist and SS Yunel Escobar to Oakland Athletics for CF Boog Powell, SS Daniel Robertson, C John Jaso and cash. May 30, 2014 Tampa Bay Rays activated 2B Ben Zobrist from the 15-day disabled list. May 28, 2014 Tampa Bay Rays sent 2B Ben Zobrist on a rehab assignment to Charlotte Stone Crabs.